Henry Watkins Allen (April 29, 1820 – April 22, 1866) was an American soldier and politician, and a general in the Confederate States Army during the American Civil War. Allen had previously, in 1845, been a member of the Mississippi State House of Representatives, and a member of the Louisiana Legislature in 1857. He served as the Confederate Governor of Louisiana late in the war. Port Allen, a small city on the west bank of the Mississippi River across from Baton Rouge, Louisiana, was named after him in 1878. In December 1860, Allen volunteered as a private in the Delta Rifles, a Louisiana Militia unit. After Louisiana's Ordinance of Secession was passed in January 1861, Allen helped seize the Federal arsenal at Baton Rouge. He later joined the regular Confederate army, in May 1861, as a lieutenant colonel, in the 4th Louisiana Infantry Regiment. He was wounded at the Battle of Shiloh and at the Battle of Baton Rouge. In 1863, he became a brigadier general and was later elected Governor of Louisiana. He was inaugurated as governor in 1864, losing office when the Confederacy fell in 1865. He was considered to be one of the top administrators produced by the Confederacy. After the war, he moved to Mexico City, where he founded and edited an English language newspaper, the Mexico Times. He had previously, in 1861, written the book Travels of a Sugar Planter. He died in Mexico City, in 1866, of a stomach disorder, and was later buried on the grounds of Louisiana's Old State Capitol in Baton Rouge. 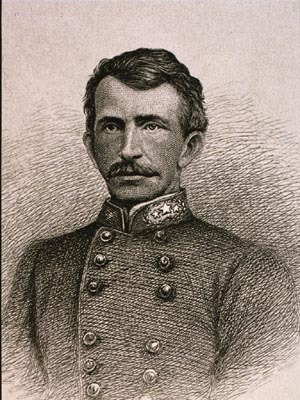 The Brigadier General Henry Watkins Allen Camp #133 of the Sons of Confederate Veterans was named in his honor, as was Allen Parish, Louisiana. The West Baton Rouge Parish community of Allendale, Louisiana is named after Allendale Plantation, the former home of Henry Watkins Allen. The neighborhood Allen lived in while in Shreveport, Louisiana, bears the name Allendale. His home in the Allendale neighborhood was located along Allen Avenue, which is one of the main streets in that area. Henry W. Allen Elementary School, a public school in New Orleans, Louisiana, is also named for him.